My mind keeps wandering to holidays and sandy beaches and warm summer nights with no responsibilities. I think I'm in desperate need of a vacation. Two weeks in a tropical paradise would do the trick, I think. But until then, I will try to remind myself of how gorgeous my beautiful city is and appreciate it while we're having this summer weather -- even if I am cooped up inside for work. 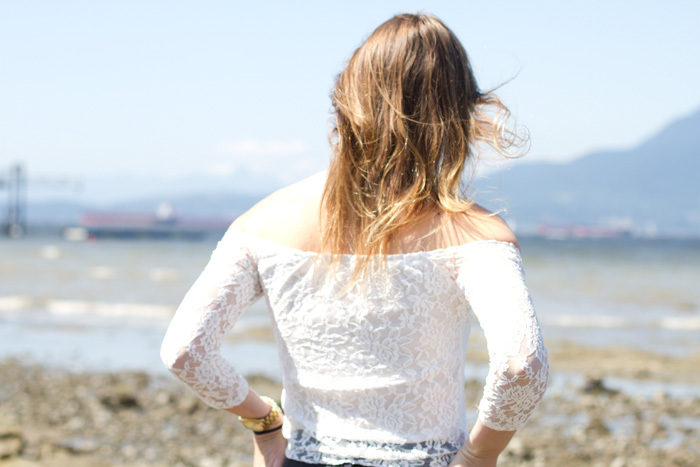 This top really reminds me of a summer getaway -- perhaps in Greece or Spain -- with it's pretty white lace and off-the-shoulder style. I usually stay away from anything that enhances the shoulders as mine are quite broad, but I just couldn't resist this beautiful thing. If you are ordering it, I would go a size up or two as it fits quite snug. I would have liked mine a bit looser but it's still pretty just as it is. Let me know what you think! Awesome summer look ... hope you get to enjoy a vacation soon. I totally know what you mean, Alison. It's so hard to focus when you just want to be far, far away without a care in the world. Hopefully you guys have something planned for this summer? Hang in there, it's almost the weekend!